My mom always picks up a panettone bread for Christmas brunch, so it tends to put me in the holiday spirit when I see them start to pop up in the grocery stores around this time of year. 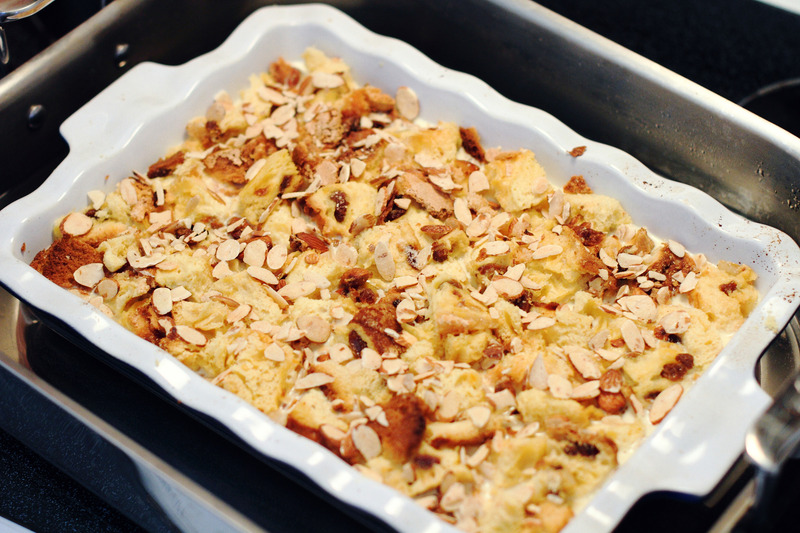 Last year it occurred to me how perfect panettone would be for bread pudding – it’s a light, fragrant bread usually baked with dried fruit and nuts – all good things to put into bread pudding. Lucky for me, life hero Ina Garten had a great recipe for it, so I decided to make it for my family this year. The recipe was delicious – a wonderful option for New Year’s, too! Trim the dark brown outer crust from the panettone (optional). Cut the rest of the loaf in 1-inch cubes and place on a sheet pan in a single layer. Toast the panettone for 10 minutes, until lightly browned. Grease a 9 by 12 by 2-inch baking dish with the butter. 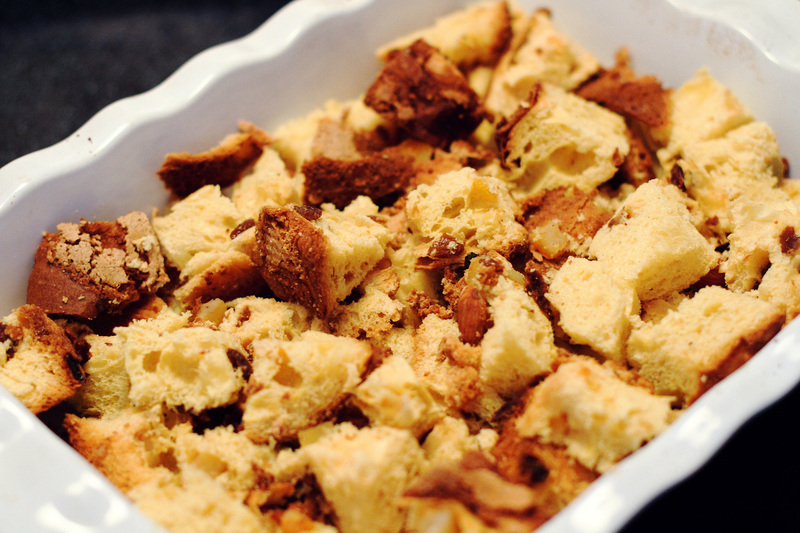 Place the panettone cubes in the baking dish. In a large bowl, whisk together the whole eggs, egg yolks, half-and-half, vanilla and almond extracts and sugar. Pour this custard mixture over the panettone. Set aside for 10 minutes so the bread soaks up the custard. Scatter the sliced almonds over the top of the pudding. Place the baking dish into a larger pan and add very hot tap water to the larger pan until it’s halfway up the side of the baking dish. 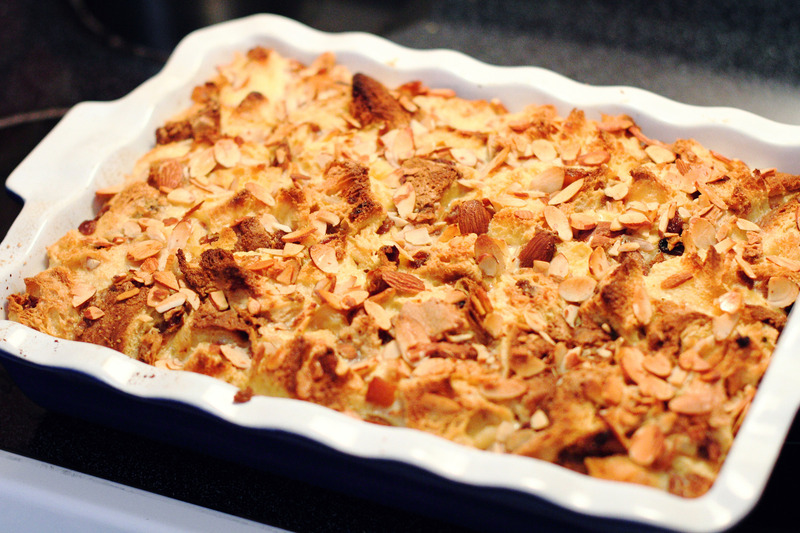 Cover the larger pan with aluminum foil, tenting the foil so it doesn’t touch the pudding. Cut a few holes in the foil to allow steam to escape. Bake the pudding for 45 minutes. Uncover and bake for 40 to 45 more minutes, until the custard is set and the top of the pudding is light golden brown. Allow to cool for 15 minutes. Serve warm or at room temperature with a dollop of whipped cream if you like! That looks so yummy. I can't wait to try it. Hope you had a lovely Christmas with your loved ones! 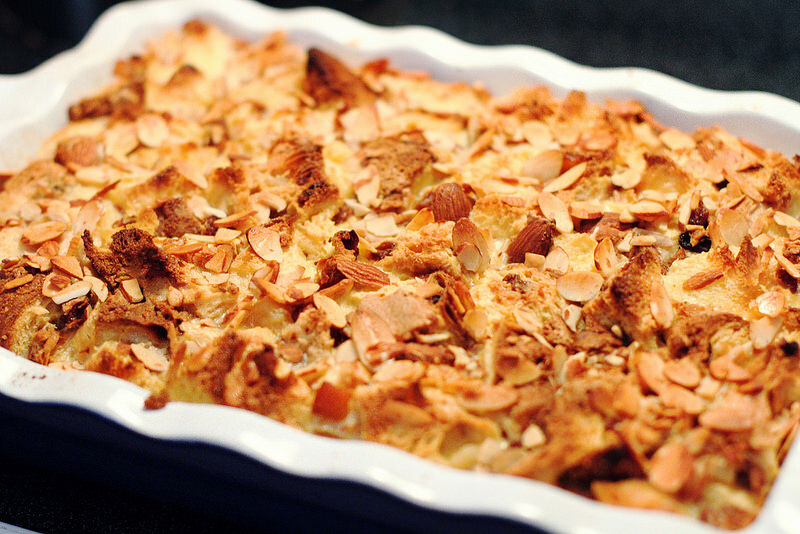 I've never actually had bread pudding, because the idea of putting bread in pudding seems strange to me since it would get soggy, but it looks incredible! 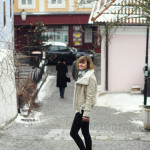 Great post:) Happy holidays, dear!